I don't know anything about neutrino scans, but I'm guessing it would be hard to scan something with neutrinos that didn't exist. Uh, just bumping random stuff that might be useful for the commentary... (I'm actually looking for a particular thread, but that's beside the point.) This thread pertains to a certain point in the OP that Shin-seiki intends to comment on, I believe... Hey, if you can salvage what you already wrote here, by all means! 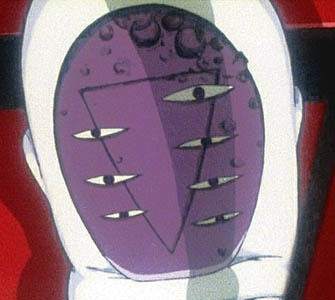 I has always been my opinion that the moon repersented God in Evangelion. And Rei is the connection to God for the human race. Take this all fimiler image. What does it really mean? Remember that "Fly me to the moon" is playing during the credits. I asure you that Anno didn't just think the song was cool. Look at the image of the moon, both of them. The bottom one is a clear moon, and the top one is a reflection in a pool of water. The person on the right is Rei, and she is covering the screen verticlly. The moon repersents God in this image, the water the Human race, and Rei the connection between the two. Or the would be connection. But what about the reflection? The reflection is the human races will to copy God. Aka, The Evangelion. The crators on lilliths mask support this, Rei becomes one with lillith to become "God"
This picture supports this theroy. Rei (God) is repersented by the moon, and Shinji is repersenting the earth and the human race. Its Shinji's desison weither or not intermentality happens. I second Shin-seiki's suggestion, as well. Also, G-spaz, while some of your analysis is quite interesting, I still don't follow your conclusion that "Moon" in NGE = "God". (However, if you said "bigass humanoid entity" = "God", I'd agree with you more readily.) The moon symbolism is clearly connected to Rei (and to Lilith via the mask), but where does the idea of "God" specifically come into the picture? Reichu wrote: Also, G-spaz, while some of your analysis is quite interesting, I still don't follow your conclusion that "Moon" in NGE = "God". (However, if you said "bigass humanoid entity" = "God", I'd agree with you more readily.) The moon symbolism is clearly connected to Rei (and to Lilith via the mask), but where does the idea of "God" specifically come into the picture? Well what does lillith become? What is the goal of insermentality? To become one with "God". As far as we know in Evangelion there isn't a suprem being known as "God" and the closest thing that can come of it is the union of Adam and Lillith. Both of them brought life into the world, and thus they would be considered "Gods". The entire idea of the Intermentality project is to become one with God (as you well know) But as we see the souls enter the Black Moon held by GNR. Three things happened in EOE to begin intermentality. Rei took adam from Gendo, Rei and Adam fused with Lillith, Evangelion Unit 01 (tree of life) fused with Rei. Those actions created the suprem being which you can call "God". The Evangelion in itself cannot be a God, for it did not create life. Evangelion was created in mans own image, the goal was not to create a God. But the Evangelion was an attempt to create life, and it worked. This comes into the reflection. Man mimicks the works of "God" or the creator of life. Also the white moon was created, or could of been, during the first impact, the creation of life. The moon looks over all things. If this is true and the White moon was created as life was, or even helped in the creation of life. Then it backs up the idea that it repersents God. God creates life. What backs up the fact that the white moon created life is that the black moon is used to take life away. Lillith's mask is the mask of God (seven eyes) and it has creators on it, as on the moon. The Lance of Longinus enters orbit around the moon. I was under the impression that Instrumentality's purpose was to evolve humanity into something equivalent to God. In #21, Gendou describes the HIP as the "path to become a god". But as we see the souls enter the Black Moon held by GNR. Instrumentality theoretically could have happened regardless of whether or not all three of the things you mention above actually occured. IMO the way that it happened in EoE was a fluke. It wasn't intended to happen that way by all of the parties concerned, but, in a way, it ended up as a conglomeration of all three envisioned methods (SEELE's two and Gendou's one). The Evangelion in itself cannot be a God, for it did not create life. According to the series, no sooner had EVA-01 stuffed her face with Zer's innards that she became a 'God'. "By Man in Adam's image" would be a little more accurate, IMO. But the Evangelion was an attempt to create life, and it worked. The White Moon and the Black Moon are both 'seeds of life' created by the alien civilization responsible for Adam and Lilith. On the other hand, First Impact supposedly created Earth's satellite, the actual Moon. All that considered, if you still think you can persuade me that Moon = God... by all means. Reichu wrote: I was under the impression that Instrumentality's purpose was to evolve humanity into something equivalent to God. In #21, Gendou describes the HIP as the "path to become a god". "Man must not create God, no one should have such power"
This still can be combined with my theroy. They are still trying to get to God, in what ever form, and they are useing Rei to do it. Once again you back up my theroy. "where all souls originated" in most religions where a God or Gods are concered one of the characteristcs is the creater of life, they returned to where they originated from. "God"
Reichu wrote: Instrumentality theoretically could have happened regardless of whether or not all three of the things you mention above actually occured. IMO the way that it happened in EoE was a fluke. It wasn't intended to happen that way by all of the parties concerned, but, in a way, it ended up as a conglomeration of all three envisioned methods (SEELE's two and Gendou's one). I have heard this said again and again, and yes there were three plans. But no one can tell me who any of them would of played out. IMO, they would of failed. I can see no way for everything that happened after Rei fused with Lillith happen any other way. But then again I could be wrong. Only Anno himself can tell us for sure. Reichu wrote: According to the series, no sooner had EVA-01 stuffed her face with Zer's innards that she became a 'God'. One of my favorite lines in the series. "Evangelion Unit 01, a living God which we have created. What Blaspshemy(sp?)! Man should not create God, no one should have such power." But I find it unlikely that Evangelion Unit 01 became a "God", all it really did was take in the S2 organ, and thus it became a full angle. I hold my my theory that GNR is the only being in NGE that can be called "God"
Reichu wrote: "By Man in Adam's image" would be a little more accurate, IMO. "Mankind found a God and man, in his folly, tried to make the God his toy. For that arrogance mankind was punished. That happened 15 years ago. And the God that man found was lost. But man continues to resurrect the God. And from that God, Adam, man attempted to make a man who was like a God himself. And that was Eva." See the above quote. But you are missing one key fact, The HIP is not approved intill after Yui's death, and thus way after the idea to create an Evangelion was concived. And on that last part I'm sure you know what I mean when I say "create life". The accual creation of another being, another race. Reichu wrote: The White Moon and the Black Moon are both 'seeds of life' created by the alien civilization responsible for Adam and Lilith. On the other hand, First Impact supposedly created Earth's satellite, the actual Moon. Once again just backing up the theory. Because the white moon was accually involved in the creation of Adam (I'm guessing since lillith is asocated with the black moon) creator of life = God! Gundampilotspaz wrote: They are still trying to get to God, in what ever form, and they are useing Rei to do it. Correction: Gendou is using Rei to do it. Rei was never part of SEELE's plans. We are, however, not talking about "most religions". We are talking about the NGE mythos particularly, where the term "God" is used almost haphazardly (IMO). I have heard this said again and again, and yes there were three plans. But no one can tell me who any of them would of played out. IMO, they would of failed. I can see no way for everything that happened after Rei fused with Lillith happen any other way. Perhaps because Rei fusing with Lilith SKEWED the results of everything that had already been set into motion. Had she not intervened, Instrumentality would have occurred in a different manner. Lilith and her soul were NOT necessary ingredients. Regardless, EVA-01 is specifically referred to as a "god", not once, but TWICE, in the series. Ergo, regardless of what you want to think, she satisfies NGE's criterion for 'god-dom'. Ritsuko: Hito [people] wa kamisama [God] o hirotta [found] node yorokonde te ni ireyou to shita. Dakara BACHI [divine punishment, retribution] ga atatta. Sore ga 15-nen mae. Sekkaku hirotta kamisama mo kiete shimatta wa. Demo kondo wa kamisama o jibun-tachi de fukkatsu saseyou to [tried to revive] shita no. Sore ga ADAMU. Soshite ADAMU kara kamisama [God] ni nisete [copy, imitate] ningen o tsukutta [made a human]. Sore ga EVA. Ritsuko: Hito no tsukuridashita (created) kyuukyoku (ultimate) no han'you (all-purpose) hitogata (humanoid) ketsui (decisive) senheiki (battle weapon). Jinzou (synthetic, artificial) ningen (human being) Evangelion. Sono Shogouki. According to the logic in NGE, Adam himself would probably also end up as a "human" (ningen) as well. So saying that Eva is "a man created in man's image" is ultimately kind of flawed. But you are missing one key fact, The HIP is not approved intill after Yui's death, and thus way after the idea to create an Evangelion was concived. HIP could well have been around in some form or another. Just because it hadn't become 'official' until late 2014 doesn't mean that SEELE didn't have the whole thing planned years ahead of time. By all indications, they DID. Reichu wrote: Correction: Gendou is using Rei to do it. Rei was never part of SEELE's plans. Irrelevant, the end result is that Rei is used. Who planned what doesn't matter when it's happening. Reichu wrote: We are, however, not talking about "most religions". We are talking about the NGE mythos particularly, where the term "God" is used almost haphazardly (IMO). Irrelevant, no matter what they use God for in NGE, it means the same universelly, a supream being. Reichu wrote: Perhaps because Rei fusing with Lilith SKEWED the results of everything that had already been set into motion. Had she not intervened, Instrumentality would have occurred in a different manner. Lilith and her soul were NOT necessary ingredients. The one possible outcome, without lillith, would be like it almost happened in EOE. The Eva series would their S2's to create an anti-AT field and then Unit 01 would fuse with the lance to become the "tree of life" a vessal for humanity. The thing that bothers me is, simply, that this makes no sence to Gendo's plan. Gendo made his plan to be with Yui again, and it seems to be that if Unit 01 is used as the vessal, then Yui would also fuse with all of the other souls. So to me it can't be that way, unless the Lance itself is accually the vessal and doesn't need Unit 01, but their is no way of knowing. On a side note, well let me warn you that this is something that very few or no one here believes. I believe that the very differnce between the two plans is that in Seele's plans not all Humans would die... in other words the human that is "like a God" the Evangelion. When Gendo let Yui fuse with the Evangelion (I assume he knew about it. Fuyutsuki did) he regreted it. So he formed a plan that would allow himself and Yui to meet again. That plan would be the use of Lillith, where the Evangelion would die. When we come to this in the commentary I'll try to prove it. Don't bring it up now. I mentioned it only to back up what I said above. Reichu wrote: Regardless, EVA-01 is specifically referred to as a "god", not once, but TWICE, in the series. Ergo, regardless of what you want to think, she satisfies NGE's criterion for 'god-dom'. That doesn't mean anything. As Ritsuko said "like a God himself" not "a god". Reichu wrote: Ritsuko: Hito [people] wa kamisama [God] o hirotta [found] node yorokonde te ni ireyou to shita. Dakara BACHI [divine punishment, retribution] ga atatta. Sore ga 15-nen mae. Sekkaku hirotta kamisama mo kiete shimatta wa. Demo kondo wa kamisama o jibun-tachi de fukkatsu saseyou to [tried to revive] shita no. Sore ga ADAMU. Soshite ADAMU kara kamisama [God] ni nisete [copy, imitate] ningen o tsukutta [made a human]. Sore ga EVA. But saying that a "God created in man's own image" is not flawed. You said yourself that the term "God" is thrown around haphazardly. Eva is an attempt to create a supream being, not only for defence, but as a living testiment that mankind exsisted. Reichu wrote: HIP could well have been around in some form or another. Just because it hadn't become 'official' until late 2014 doesn't mean that SEELE didn't have the whole thing planned years ahead of time. By all indications, they DID. Yes, but the "Who? What? Where? When? How? Why?" wouldn't of all been defined intill they could make it offical. Forgive the lastness of my repliy, I wanted to watch more of the series again to find more to support this theory, and yes I did find it. 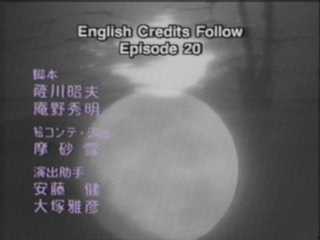 Episode 14 "Seele throne of Souls" this image supprots that the moon in NGE repersents God. Gundampilotspaz wrote: That doesn't mean anything. As Ritsuko said "like a God himself" not "a god". ??? Can you dig up the full quotes and when they occurred? Reichu wrote: ??? Can you dig up the full quotes and when they occurred? "Humans found a god, and thus, tried to obtain that. As the result, punished were humans. That was 15 years ago. Vanished the god that they found. They, however, tried to revive the god by themselves. That was Adam. Made from Adam to be close to the god was a human. Eva is that." I think the translation "make a man who was like a God himself" definitely assumes too much. (Man... Himself... ) Literally, the sentence in question comes out like, "And from Adam, God [or "a god"] was copied/imitated and a human was made. That was Eva." I'm still not quite sure why they refer to the Evas as "human" right off the bat, since they're obviously different from us on a biological level. Unless their genomes are a composite of Adam and regular humans, Evas would have no more in common with Lilim-humans than an Angel (and, by extension of that, Adam itself). So if you're going to call the Evas "human", you'd have to call all of the Angels "human" as well... Although I suppose that's basically what Misato does in #25'. As far as your nitpick about what Ritsuko said implying that EVA-01 is not technically a "god"... "Sore ga EVA" refers back to her previous sentence, which was in the PAST TENSE. In episode #21, SEELE effectively says that EVA-01 has become a god by assimilating the S^2. Man 02: Incorporating the S2 engine by itself, it obtained the ultimate existence. Evangelion Unit One. Man 03: The living God created by us. It is blasphemy. Keel: The creation of a God is not allowed. Man 12: I will not allow him to have a God. Man 13: Ikari Gendou, can we trust you? But, really, when I said they throw around the term "god" haphazardly, I meant it. The type of "god" that EVA-01 becomes is evidently defined as a being that has both the Fruit of Life and the Fruit of Knowledge. But "Adam" was branded a "god" as well, even though he only had one Fruit. Is it just me, or is there a problem here? Reichu wrote: I think the translation "make a man who was like a God himself" definitely assumes too much. (Man... Himself... ) Literally, the sentence in question comes out like, "And from Adam, God [or "a god"] was copied/imitated and a human was made. That was Eva." It seems to mean the samething to me. The first one is saying that a human was made that was like a God. The second one is saying that God was copied to create a human. Perhaps the second one is closer to the truth.... God made humans in his own image. Humans made Eva in Adam's image. If Adam is truely a God, then indeed on a biblical level, Eva's are human. Reichu wrote: I'm still not quite sure why they refer to the Evas as "human" right off the bat, since they're obviously different from us on a biological level. Unless their genomes are a composite of Adam and regular humans, Evas would have no more in common with Lilim-humans than an Angel (and, by extension of that, Adam itself). So if you're going to call the Evas "human", you'd have to call all of the Angels "human" as well... Although I suppose that's basically what Misato does in #25'. "Yes. Although composed of a different form of matter, their actual composition in terms of the arrangement and coordinates of the pattern is a 99.89% match to ours." As early as Episode six was the idea that humans and the angels aren't that differnt was introduced. "They plan to initiate Third Impact - not with Angels, but by using the Eva series. And here is the Misato quote that you mentioned. It mentions both Adam and Lillith as "Sources of life"
This sugjests that not only are the Evangelions Human, but all the angels are. created by Adam and Lillith. Beings who can be considered "Gods" because they have created life. Reichu wrote: As far as your nitpick about what Ritsuko said implying that EVA-01 is not technically a "god"... "Sore ga EVA" refers back to her previous sentence, which was in the PAST TENSE. In episode #21, SEELE effectively says that EVA-01 has become a god by assimilating the S^2. The fruit of life and knowledge could of always have been part of the Evangelion. Because they were created from Adam, and yet they have a human soul. Why Eva was branded a God after he took in the S^2, I don't know it could be many reasons. It could be because its now uncontrolable, it could be because it has become self-aware. Adam on the other hand really can be classified as a God, because it created life and holds the tree of life. Lillith can also be classified as a God for the same reason. Honestly I have always believed that the being that holds the Tree of life and Knowledge is the only being that can be called a "God" This being might of split at the begingin of time to create Adam and lillith. So in the ultimate sence God is only seen in 26', never before. All others are only interpratations of what a God must be. Based on seele saying that Yui became a God just by taken in the S^2 engine can't be true. Because then all the angels would be considered a God. Saying that it only had the Fruit of Life and Knowledge at that point is more possible, but it could of always had both. Remember it is designed on Adam, with a Lillim soul. Gundampilotspaz wrote: As early as Episode six was the idea that humans and the angels aren't that differnt was introduced. So essentially in NGE the term "human" is thrown around as randomly as "god". The fruit of life and knowledge could of always have been part of the Evangelion. Because they were created from Adam, and yet they have a human soul. Why Eva was branded a God after [s]he took in the S^2, I don't know it could be many reasons. It could be because its now uncontrolable, it could be because it has become self-aware. The Fruit of Life is equivalent to the S^2, which for whatever reason the original Evas did not have. Perhaps, as AchtungAffen has argued in the past, having the S^2 is intimately connected to having the soul of an Angel -- because, as we know, having a Lilim soul automatically means one has the Fruit of Knowledge. If this is true, then the Evas start out as a blank slate because they have no soul at all -- no Fruit of Life, no Fruit of Knowledge. They can get the FoK by having a human soul salvaged into them, and Yui discovered the loophole that let her obtain the FoL. EVA-01 was arguably self-aware the moment she received Yui's soul. And arguably EVA-01 was no more "uncontrollable" after assimilating the S^2 than she was before. She went dormant after going nutzoid in #19 and allowed herself to be re-Caged. Sadamoto's "spider-silk" scenario in the manga really doesn't work, IMO. The only way Shogouki could be stopped at that point was if she stopped herself. Although he says "like a god", while SEELE didn't bother with the "like" bit. Bloody semantics. Honestly I have always believed that the being that holds the Tree of life and Knowledge is the only being that can be called a "God" This being might of split at the begingin of time to create Adam and lillith. So in the ultimate sence God is only seen in 26', never before. All others are only interpratations of what a God must be. As has been regurgitated many times, NGE2 implicitly states that Adam and Lilith were different entities from the get-go -- independent creations made to each propagate a different type of lifeform. Based on seele saying that Yui became a God just by taken in the S^2 engine can't be true. Because then all the angels would be considered a God. But the Angels don't have the FoK, see. There is an enddless stream of data we can look though to prove our points. But I want to ask you how you believe Evangelion Unit 01 moved without power in Episode 16? Could the Eva already of had an S^2 before Ep. 19? Possible, but unlikely. Gundampilotspaz wrote: There is an enddless stream of data we can look though to prove our points. But I want to ask you how you believe Evangelion Unit 01 moved without power in Episode 16? Could the Eva already of had an S^2 before Ep. 19? Possible, but unlikely. Er, I never advocated that EVA-01 had an S^2 before #19, so I'm not sure what you're getting at. But to answer your question, in NGE the soul can apparently generate a limited amount of energy on its own to be used on an intermittent basis, as demonstrated by Yui-sama, Kyoko-sama, and even (behind the scenes) Lilith. As far as the "endless stream of data goes"... It's a matter of how well the data is utilized to "prove a point". Apparently neither of us is convincing the other of anything, so we must both be crappy debators with too much free time. Reichu wrote: Er, I never advocated that EVA-01 had an S^2 before #19, so I'm not sure what you're getting at. But to answer your question, in NGE the soul can apparently generate a limited amount of energy on its own to be used on an intermittent basis, as demonstrated by Yui-sama, Kyoko-sama, and even (behind the scenes) Lilith. I really don't know, I'm more adept at the Philosophical parts of Evangelion rather then the technecal ones. I don't know exactly how Anno defined "God" in the series, we can only guess. Reichu wrote: As far as the "endless stream of data goes"... It's a matter of how well the data is utilized to "prove a point". Apparently neither of us is convincing the other of anything, so we must both be crappy debators with too much free time. I don't think we are carppy debators we both brought up good points and backed them up. The problem is with the question. And I think we can put both the diffenition of "God" in Evangelion and Rei and the moon on the back burner intill we get to it in the commentary. Then hopefully the collective effort of all of us can solve the problem rather then argue over it.